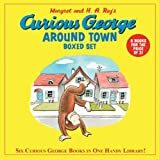 George was a good little monkey and always very curious. George poured the batter into nice round circles. He waited just a minute to let the pancakes cook. Then he flipped them over. And last, he added syrup.